Want some tricks to make moving easier, cheaper and better? The average mover can waste many hours of time and hundreds of dollars during the moving process. If a move is especially complicated, the mover may waste even more. Packing– what, how and when to pack. Loading – plan a route for moving large possessions, like couches, out of your house. Take measurements. 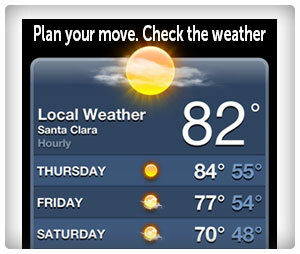 Weather – when a few days away from moving, check the weather and plan accordingly. Moving checklist – there are many other things that should be dealt with prior to moving. Check out our moving checklist for more details. Don’t Wait Until the Last Minute – get on your move well before it is set to take place. Waiting until the last minute to do things will only lead to stress and mistakes. Look for Free Supplies – you can buy moving materials, but you can also find moving supplies for free around your house or in your community. Get creative. Get Rid of Stuff – getting rid of possessions that you don’t need or can replace can save you hundreds of dollars on your move. You can sell a lot of stuff on Craigslist or by having a yard sale. Use Help – a common moving mistake is trying to do everything yourself. It’s an easy way to waste a lot of time, and it can lead to injury. Get your friends and family to help you pack and load your belongings. Call Around – moving services, like any business, will vary in their prices. Some may be cheaper for certain types of moves, and other simply might be all around cheaper. You should call more than one moving serviceand compare quotes. Or get free moving quotes from MovingGuru.com.